This could ease a months-long political blockage in Catalonia, as it means separatist parties will designate a new candidate for the presidency of the region. 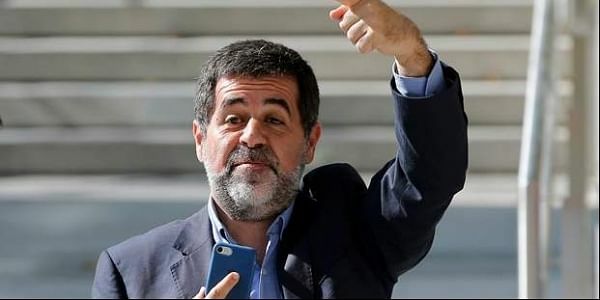 BARCELONA: Jordi Sanchez, a separatist civic leader in jail over his alleged role in Catalonia's secession drive, has dropped his bid to lead the region, the Catalan parliamentary speaker said Wednesday. "Faced with the repeated violation of his fundamental rights... the lawmaker Jordi Sanchez sent me a letter announcing he was renouncing his candidacy," Roger Torrent said in a televised statement. This could ease a months-long political blockage in Catalonia, as it means separatist parties will designate a new candidate for the presidency of the region which has been under direct rule from Madrid since October 27 when lawmakers declared independence. While separatist parties won subsequent regional elections in December, retaining their absolute majority in parliament, they have still not been able to form a government as their two candidates for the presidency proved problematic. Catalonia's former president Carles Puigdemont, who was sacked by Madrid after the independence declaration and left for Belgium where he lives in self-exile, was their first candidate to lead the region again. But he eventually dropped his bid. Puigdemont instead proposed Sanchez, the former head of the influential pro-independence ANC civil society group. But this too proved problematic as Supreme Court judges refused to release him for a crucial parliamentary session that would officially appoint him president. In his statement, Torrent said he would start a new round of talks with parties in Catalonia to find a new candidate. One name that has been raised is Jordi Turull, the former Catalan government spokesman who is also under investigation over the secession drive, but is free.